The winner of this competition gets $35,000 to build the art and a $5,000 honorarium. This is a great idea and it would be lovely to see Harvard bring the same spirit and modest budget to Allston where it could help enliven Barry's Corner and many other public sites where Harvard's drab buildings and empty lots could be dramatically improved. "The Radcliffe Institute for Advanced Study is sponsoring an annual competition that highlights the potential of public art, and the visual arts in general, to contribute to intellectual conversations at Harvard and beyond." Harvard is occasionally accused of being too insular and inward-focused, and images like this in Harvard's new Master Plan only reinforce that perception. If Harvard really cares about the view from the Eliot House Tower in Cambridge to Baker Library on the HBS campus in Allston, that is certainly their prerogative. To me it seems like a strange priority. The tower's Celtic green cupola and gilded accents are lovely to look at, but how many people ever climb the tower to gaze across the Charles at Allston? This is also an amazing image to submit to the Boston Redevelopment Authority and the residents of Allston/Brighton. Where are the new visual and architectural focal points that Harvard plans to build in Allston? What new view corridors does Harvard plan to build to visually connect the Allston community with the new Harvard Allston campus? Apparently there are few, if any. The existing east-west view corridors (shown in red) of Hopedale St & Amboy St don't even connect with the blue "extended axis" lines that Harvard proposes on the currently abandoned Sears site. The extended axis that continues east from Bertram Street cuts through the middle of the Science Complex but doesn't align with much of anything that architecturally had been proposed for the Science Complex. Hopefully we will see that corridor become a reality in the Science Complex re-design. Finally, the extended axis that continues east from end of Rena Street cuts through the warehouses and truck maintenance facility that Harvard proposes to build at the intersection of Rena and Travis Street. The back-side of Harvard's proposed basketball arena gets two black dots indicating "focal point opportunities". But it is only the back-side from my view in Allston. For Harvard, that is the front of the arena, and the view from Harvard Stadium is what matters to Harvard, not the view from Allston. "...In the past 20 years, Harvard has repeatedly neglected the short- and long-term needs of Allston residents in favor of pursuing its own grand plans for expansion. 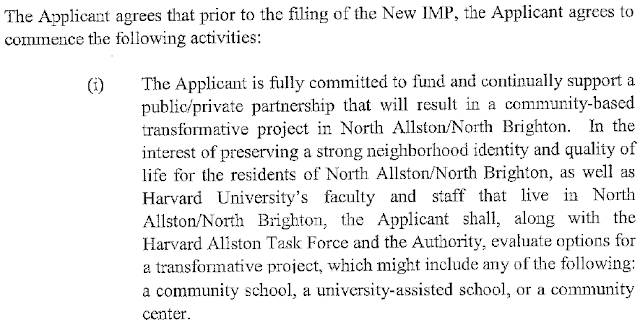 Unfortunately, unfulfilled promises of community development cannot rectify a decision-making model that does not account for the needs of community residents..."
Allston cash to fund Harvard "other projects"
LAPP: In Allston, the planning has shifted significantly in the last few years. It’s much more focused on a five- to 10-year time frame; it’s using our assets to generate income that will support other projects. The big project we’re building in Barry’s Corner, the multiunit market-rate rental housing and retail complex, is being done with a developer, and the long-term ground lease will be providing income to the University. Rena Park is not "due" until the Science Complex is occupied. If Harvard keeps its new timeline and re-starts construction in 2014 it will probably be 4-5 years until it is occupied. That being said, when will the interim improvements, design and planning begin so that they will be completed in time? Aerosmith plans concert outside their former Allston apartment building at 1325 Comm. Ave. - Allston Brighton - Your Town - Boston.com: "Aerosmith plans to perform a concert Monday outside the Allston apartment building at 1325 Commonwealth Ave., where the band lived in during the early 1970s when they got their start. According to radio station 97.7/107.3 WAAF, which is helping to throw the pre-Election Day party and concert, the show will begin at noon on Monday, Nov. 5. Good bread comes to those that wait - Swiss Bakers to open before 2013? In March 2011, Harvard President Drew Faust told us that Harvard had recently signed a lease with the Swiss Bakers company to rent Harvard's former Volkwagen dealership on Western Ave.
"When we come together for the 10th Boston Shines next year, you will see Stone Hearth Pizza across the street, Swiss Bakers café and the Innovation Lab down Western Avenue." 2012's Boston Shines came and went without the bakery opening, and 17 months later we are still looking forward to when Swiss Bakers arrival. But according to this tweet, our wait is almost over and we will have fresh pretzels come New Years. Click here to read about their priorities, how they will help create jobs, and more.